Trugo is a sport invented in the railway repair workshops of Newport in the Western suburbs of Melbourne by railway workers in the 1920s. There are only 2 "games" that can be claimed to have been invented in Melbourne. Trugo like Australian Rules Football is one of Victoria's few indigenous sports. While Aussie rules has become a national sport, Trugo is only played in Victoria. It is still played in the suburbs every week and apart from it's players, most people have never heard of it. Played outdoors on a green similar to that used for Lawn bowls (90 feet / 27.4 meters in length for men, 70 feet / 21.3 meters for women), the objective of the game is to score goals or points by striking a rubber ring (wheel) with a mallet though a pair of goal posts. The player stands on a rubber mat and is facing away from the goals, feet either side of the wheel. The short handled mallet is swung between the player's legs to strike the wheel ('tunnelling style'). The player's opponent ensures that the wheel is safely contained by collecting it in a canvas bag attached to a long pole once the wheel has passed the goal line. The players swap roles after four wheels have been struck by the first player. Each player has 24 shots, 12 from each end. The player or team with the most goals at the end of the playing period is declared the winner. The sport is played by both men and women; the women's version of the game traditionally has the player strike the ring while standing to one side ('side sweeping style'), and is known as GoTru. 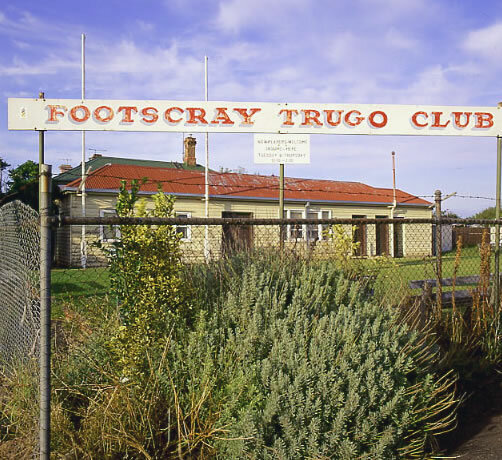 The principal Trugo clubs are Brunswick, Footscray, Port Melbourne and Sandridge. "Tunneling the wheel" OR "Shooting the ring"? 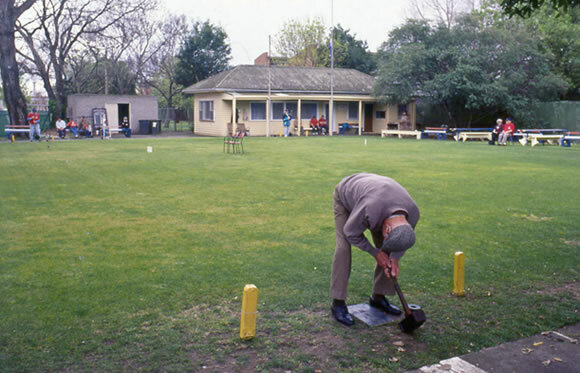 You must be playing the uniquely Australian (and Victorian) sport of TRUGO, a hybrid of LAWN BOWLS, CROQUET & WOODCHOPPING. Trugo is played throughout Melbourne from August through to April. Men play on Thursdays, women on Saturdays.